PERRYVILLE. MO — Former Cardinal’s pitcher Al Hrabosky aka “The Mad Hungarian” was the guest speaker on Nov 4 at the Inaugural Community Foundation Humanitarian Award Dinner. The evening began with cocktails at 6 p.m., dinner at 6:45 p.m., and words from Hrabosky at 7 p.m., followed by an award presentation at 7:45 p.m. Source: Perryville News. Al Hrabosky played for the Cardinals from 1970-1982 and is currently the color commentator on Cardinals regular season broadcasts on FSN Midwest. He also owns Al Hrabosky’s Ballpark Saloon, which is located right across the street from Busch Stadium. Following his playing career, he has provided color commentary for Cardinals games since 1985 and has been with Fox Sports Midwest since 1997. Hrabosky also hosted his own radio show on KFNS 590AM in St. Louis. With a reshuffling of duties for 2011, he will lose about 20 games, in working 100 games out of the 150 broadcast by FSM. He also serves as an occasional fill-in analyst on the Cardinals Radio Network. PFP Sports & Celebrity Talent Agency is a booking agent for motivational sports speakers and celebrities. 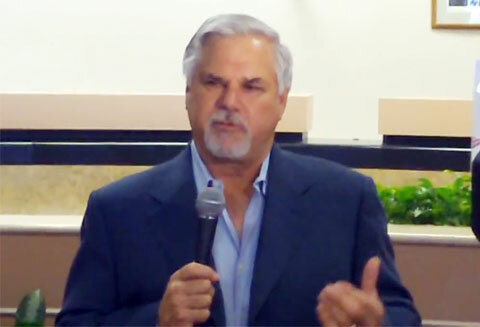 If you would like to book baseball speakers or MLB stars like Al Hrabosky for a speaking engagement, personal appearance or special event, you can request Al Hrabosky agent and speaker information from PFP Sports & Celebrity Talent or call 800.966.1380.